This is a card I made at my up lines Open House. This card is so simple but it is absolutely gorgeous. We used Pink Pirouette card stock and ribbon, Shimmery White and Black card stock. Two silver brads and Silver Hodgepodge Hardware were used for the main image. 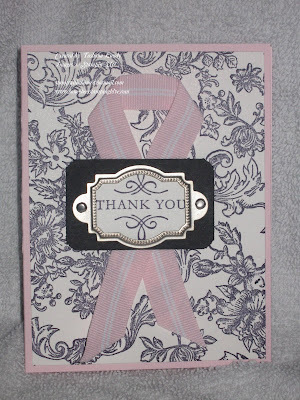 The sentiment was stamped in Basic Black ink...Elegant Thank You (#114484) only $6.95 (pg. 208). For the background we used Bella Toile (#111598-pg. 129); it was also stamped in Basic Black. We used the Corner Rounder punch on the black card stock.